Pine boards measured only one criteria: penetration. Penetration remains as a constant that cannot be compromised. Later, duct seal and clay were used to gauge the upset of expanding bullets. Both of these materials are unrealistic, overstating expansion dramatically while retarding penetration. Today, ballistic gelatin is heavily used in ammunition testing but is recognized as at best an approximation of the human body. Much emphasis is placed on handgun ammunition, and we should endeavor to make an intelligent choice. But the study of tactics and human reactions in a gun battle is more important and should receive the lion’s share of study. The most important single predictor of gun battle survival is training. The most important immediate factor is marksmanship. More often than not, gun battles are won with pretty ordinary equipment. There are two basic camps as concerns handgun bullet study. One prefers to study actual shootings, the other will conduct laboratory tests of expansion and penetration. 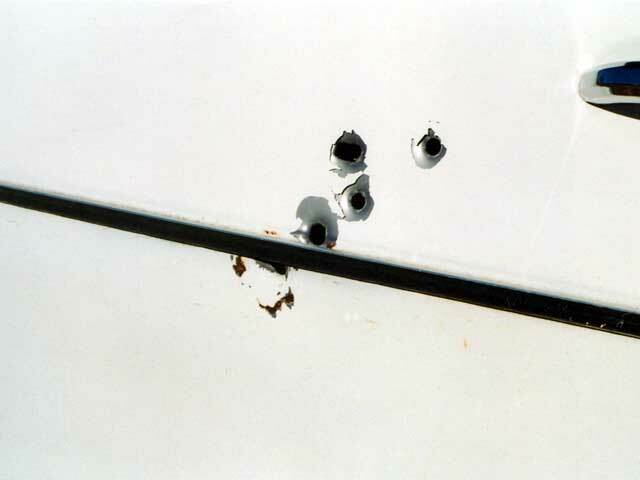 It is obvious that each shooting is a unique occurrence. By the same token, laboratory testing cannot duplicate differences in point of impact, attitude, muscle structure and the level of intoxication in a subject. Lab tests are scientific. Histories of shootings are far less reliable. They simply cannot be supported by scientific criteria. A scientist can only present his data and ask you to make your own interpretation. You are free to make your own tests to confirm or deny his results. That is the heart of the scientific outlook. 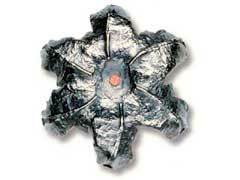 Stopping power studies are unreliable compared to laboratory results. It is strange to some of us to see results quoted as gospel in the popular press as if the various studies were the King James version of stopping power. In fact, they are fraught with problems. Worse, some go past reporting shooting histories and engage in predicting the effectiveness of one load or the other, often arriving at figures that are preposterous to those who have observed shooting results over a period of time. This is no surprise - the conclusions are based on flawed data. It is interesting that after quoting impossibly high claims for minor calibers, some ‘scholars’ have adjusted their figures downward to stay in touch with reality. This is after the published figures were met with incredulity. We have to remember that any peace officer or trained investigator who could not identify his sources would realize that his material did not meet a simple investigative standard. The validity of his work would be zero. On the other hand, as a former peace officer, I can understand the need for confidentiality. A respect for families and for those who simply do not wish their war stories printed must be maintained. By the same token, without due documentation and a willingness to open our files to investigators, we cannot expect our material to be accepted. Officers working trouble spots such as Area Six, Chicago, the Bronx in New York, or the Wall in California have seen the damage inflicted by most of the popular handgun calibers. They also realize that eyewitness accounts by those testifying in good faith often differ considerably in perspective. By applying normal investigative discipline to stopping power studies we find they come up short in reliability. Most do not even meet the standards set forth for finding fault in a motor vehicle accident! Some trainers and armed civilians do not study the various debates on handgun effectiveness and concentrate upon marksmanship, tactics, and standard service grade equipment. When we criticize issue gear and equipment, we undermine an individual's confidence in his gear. Often, the man issued a 9mm pistol or a double action only type - neither of which I care for - is simply stuck with the pistol and must do the best he can. The man or woman behind the sights of these guns can make all of the difference. Among the most inane comments ever to see print and one that did armed individuals great injustice was a pat pronouncement on shot placement. This individual told us that load selection is more important than shot placement! The point was that we cannot control shot placement but we can control load selection, and a good hot load might serve even if not well delivered. Anyone who has shot game knows better than that. This is even more true in self defense. Accuracy can make up for power. The reverse is seldom true. The bullet must be delivered to the right place, and that is the blood bearing organs. Only loss of blood and actual damage can be counted upon. A bullet that makes a peripheral hit simply cannot be counted on, whatever the caliber. Most stopping power histories we care to study are based upon flawed precepts. As an example, multiple strike histories are discarded. In other words, to be included in the data base, the incident must be one in which only one shot impacted the person shot. A success is counted when the person shot stops his violent action or runs no more than ten feet after being shot. That is fine as far as it goes, but quite a number of shooting incidents involve more than one hit...especially in the minor calibers. One shot failures will be rare. If one shot fails, why would we not fire another? Trained shooters often make double taps on the target. The type of methodology used in many studies can accomplish only one thing, and that is to make smaller calibers look better. By excluding multiple hit failures then we have eliminated a great number of incidents. On the other hand, large caliber handguns will more often solve the fight with a single round and the numbers excluded will be less. As for medical reports, I have met experienced peace officers and coroners who could not agree upon the number of hits and exits on a felon’s body. In another case, a medical examiner taught a class I attended in which he spoke in glowing terms concerning a bullet that he felt performed in the ideal range. He showed us photos of the wound track from a shooting, and allowed us to examine a picture perfect recovered bullet. Some years after the class, I met the officer who fired that bullet. He stated that the subject took the shot, stopped his attack, but remained mobile and asked for an ambulance. He felt that had the man had the determination, he could of continued his assault. Opinions from the field and the lab can conflict. The multiple shot question is pretty simple. When human beings fight for their life, they become excited. Often, they strike the object of their passion as hard and as many times as possible. This may mean five or six .38s, seven .45s or thirteen 9mms.If the felon goes down in the volley, the shooting is a success. If he is still standing, we have a failure to stop. When we study what happens during gunfights, we should study the tactical information first and bullet performance second. We can study comparative bullet performance in the laboratory. No, gelatin is not flesh and bone, but it is useful in comparing one bullet to the other as a general outline of performance. The exact placement of the shot will matter the most. The threatening person who is shot may be under the influence of certain drugs that are based upon painkillers. When we compare the power available in handgun bullets to that of long guns such as the 12 gauge shotgun or the .223 rifle, we find that the ‘weak .38’ and the ‘strong .45’ are more alike than they differ! Over time, the inescapable conclusion is that the key to handgun stopping power is marksmanship. But big bore handguns make a bigger hole and let out more air. This makes for more rapid blood loss, the only mechanism that can be counted on to do the business. Penetration must also be considered. We are looking for a balance of penetration and bullet expansion, and I tend to favor penetration. Sometimes, penetration is spoken of as a bad thing. We do not wish to let off a high power rifle round in an apartment complex, true, but on the other hand the level of penetration needed in a defensive handgun is often misunderstood. A projectile that has only five to seven inches of penetration in gelatin will not do the business. If the adversary has his arms extended and is firing at you, chances are good one of your bullets will meet his arms and may be stopped by heavy bones. If the bullet has to penetrate thick clothing such as a leather jacket, the chances of the bullet reaching the vital organs are greatly reduced. A bullet with a minimum of ten to twelve inches of penetration in flesh and bone is needed. If light cover or vehicle glass is a consideration, even more penetration is needed. When choosing a defensive handgun caliber and loading, take your own counsel and conduct tests that reveal bullet performance. Don’t take to hard a presentation that has as much credibility as little green men from Mars. I don’t believe in little green men but I do believe in big bore handguns. The 9mm isn’t ok. Tell the fellow who took four 9mm soft point bullets and still managed to inflict a nasty wound that remains with me to this day, and gives my face ‘character’. The .38 isn’t enough. I once shot a fellow in the lower leg who debated with me whether he had been hit at all until the blood ran from his shoe - then he commenced whimpering and crying. I once fired a single .45 caliber hardball round on the move, quickly, and the effect on the target, struck in the ribs, was immediate. All motion ceased - and he fully recovered within a few weeks. 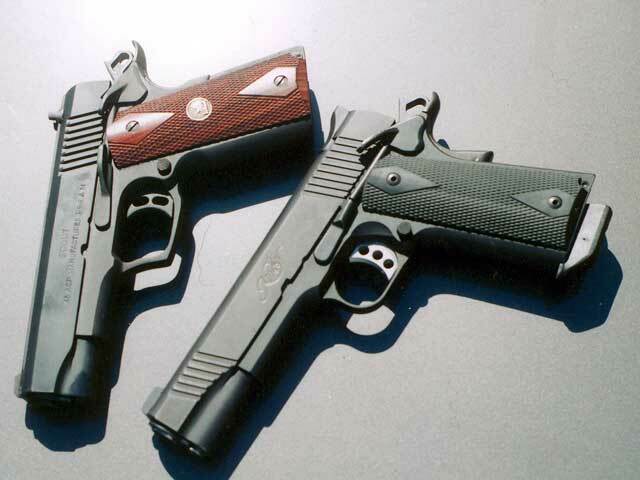 Two of the author's favorite handguns, a Century Scout .45 and a Kimber Custom II. Vehicle penetration can be important. These were drilled by Cor-Bon .357 Magnum loads. 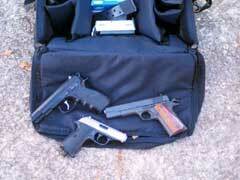 Author's range bag - range work matters more than anything else, given good handgun selection. An expanded Federal Hydra-Shok bullet - this is as good as it gets. 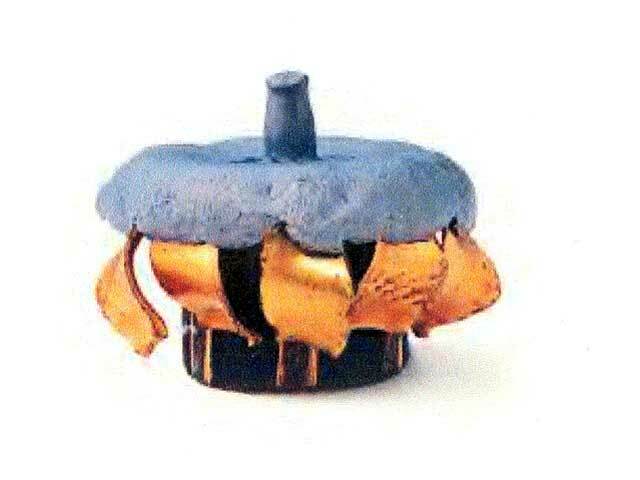 An expanded Speer Gold Dot bullet - this bullet always gives a good balance of expansion and penetration.